Jazz Monthly: Tell us about your background. Where are you from originally and when did you first start playing the sax? How did it all start for you? Vann Burchfield I was born and raised in Bessemer, Alabama. I am the oldest of 5 boys with 1 older Sister. We always had music in our home. I started taking Piano lessons at age 6 and then at 10 I began playing the guitar. I have always had the gift of music.. I could play by ear at an early age. I started out in the public school system playing music in beginner band in the 4th grade. I actually played clarinet for the first two years. It wasn't until I picked up the saxophone that I knew my life would never be the same... I just felt something different when I played the saxophone. After 45 years I still get that same feeling. 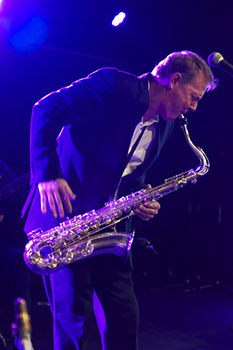 JM: I don't think anyone can do an interview with you without talking about your incredible place in the Guinness Book World Records for the longest continuous note on a saxophone using the circular breathing method. A world record of 47 minutes 5.5 seconds! Wow! Tell us the story of how this came about and how you even knew you had this kind of ability? VB: I was actually in the 7th grade when my band director told us about Circular Breathing.. I learned the technique back then. But when I saw Kenny G on the Tonight Show say that he was going to try to go about 20 minutes. I knew then that I wanted to see for my self if I could go longer.. It took me about 6 months to go up to his 45 minute time. My longest time in rehearsal was 1 hour 8 minutes and 22 seconds. I knew then I could officially break his record.. I contacted Guinness and they sent me all the rules and regulations so I would do the record properly. On my first attempt I went 47 minutes and 5.5 seconds.. It was enough to set the new world record. 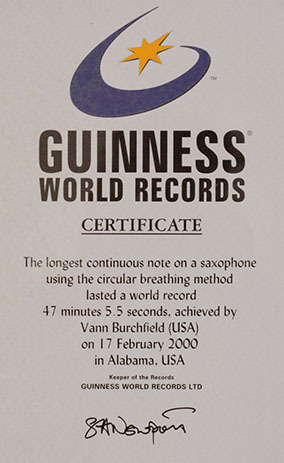 Guinness accepted my record and then told me that they were going to cancel the category and that I would remain the record holder indefinitely. I am honored to have held the record for the last 18 years. JM: You performed at the White House and their Annual Holiday Open House during the Christmas season for five years. Something not many of us can even dream about. What was the experience like? VB: It was one of the greatest experiences of my life. I met so many wonderful people! The sound of my horns filled the East Room of the White House. I remember looking out in the audience and seeing the expression on the guest faces. It was a memory I'll never forget. I am honored that they invited me 5 times. JM: How would you compare your new release " Lay Back" to your other releases? What is the concept of the album as a whole? VB: Most of my other albums I have released were me finding out who I was going to be in the Jazz world. I have always played Pop and R&B with my horns. I wanted to take my music in another direction. Jazz has always fascinated me. I am still learning and growing in this new adventure in Jazz. Lay Back was a concept of Relaxation. I wanted to provide an album that could be listened to at a time when people needed to just chill and lay back, you know and take a break. Since we live in a crazy hectic world at times, I wanted to provide an environment musically to just lay back and relax. JM: Both the title track "Lay Back" and the Vocal cut, I think you hit it spot on. It definitely carries that magnetic and hypnotic vibe. Tell us a little bit about the "Lay Back" track. What were you feeling when you composed this track? How did the Vocal Cut come about? Was it a vocal first or instrumental? VB: I was in the studio working on some grooves and playing my keyboards.. All of the sudden this groove and feel came in my head... Then the words just started to flow. Lay Back.. Lay Back and do what? I said.. Lay Back and feel the Rhythm, Lay Back and Feel the Groove. It just took of from there. I knew instantly I wanted to have both a instrumental version and a vocal version of the song on the album. JM: The track "Morning Drive" is a very appealing and energizing song. It's just one of those complete songs that just does everything for you. If you're in the car you want to just stand up in your car and dance, you know? VB: I love the song Morning Drive!! I start my show with that song now! My friend and keyboard player Kevin Taylor and I wrote that song together almost 10 years ago.. I had a different direction for it but never really felt it was right so I put it on the shelf. Then one day I was playing around with it and the new melody came in my head. I play the lead piano part on that song and also the Tenor Saxophone. You are right.. It is just a good grooving song that makes you want to dance!! JM: You wrote and co-wrote all the tracks on "Lay Back." Give us a brief tour of the collaboration and development method on this project. VB: My friend and keyboard player Kevin Taylor and I have been producing my music for the last 20 years together. We work really well together in the studio. He takes my thoughts and concepts and takes them to a new musical level for me. JM: Drum programming has become such an art in itself. The drum programming on "Lay back" is very tasteful and really unites the songs in a very "live" way. How did you achieve this? Any tips for the upcoming programmer? VB: Yes, the groove sets the song in motion! I love a good groove and have worked hard to develop the skills it takes to produce such a groove. Kevin Taylor is great at producing grooves as well. On the track Lay Back I actually took a portion of a groove from a loop that I found and added a few other sounds to make it the groove that is on the track. My tip would be, to start out finding groove you like and try to reproduce them.. That way you are able to understand how to recreate what you already hear first. Then you can start creating grooves that you only hear in your head.. If it feels good to you then others will like it too!! JM: How do you think you have grown as a composer and musician over the years? Are you inspired by the same things now as you were back then? VB: For me, I know I continue to rediscover myself. I find that through my life experiences I am changed. I am learning more about myself the older I get. I now only want to be the best me I can be.. I challenge myself more than anyone or anything else could. I am exploring new ways to express myself through my music. The saxophones are becoming more of an extension of myself so that I can more freely communicate what’s going on inside of me. I am inspired differently now more than I ever have.. I have recently reconnected with my high school sweetheart. I will tell you that more songs have been written about love than any other subject.. It is an emotion that grips us like no other. I am excited about my new upcoming project because it is filled with a love that I have never experienced before! JM: Songwriting is said to be the essence of who you are. 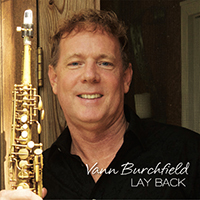 Who is Vann Burchfield? VB: I am a lover of peace, happiness, joy and contentment.. I hope my music will always reflect the inner peace and joy that I have. I work very hard to maintain peace in my life. I have to forgive others instantly when I don't want to. I have to release all of that junk so I can be free! I only hope my music reflects the inner peace that I have in my life.